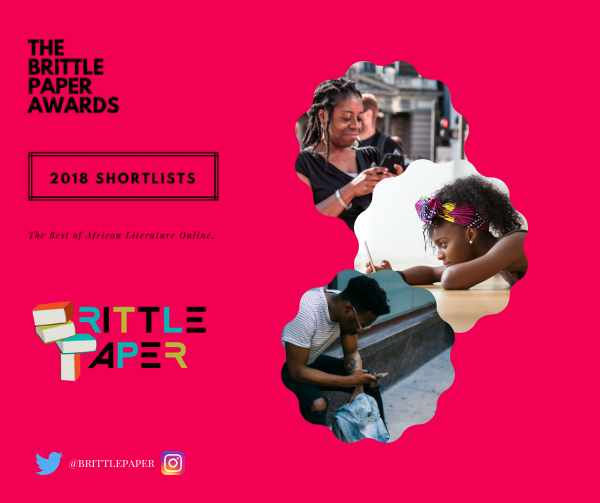 Leading literary blog Brittlepaper.com announced its Brittle Paper Literary Awards 2018 shortlists on October 4, 2018. This is the second time that the awards will be running. To celebrate the blog’s seventh anniversary, the Brittle Paper Awards were inaugurated with winners to be awarded in Fiction, Poetry, Creative Nonfiction/Memoir, Essays/Think Pieces, and the Anniversary Award. From the shortlist that was announced in August 2017, the winners were Sisonke Msimang, Megan Ross, JK Anowe, Hawa Jande Golakai, and Chibuihe Obi. The 2018 edition of the awards are upon us and the categories and their value are Brittle Paper Award for Fiction ($200), the Brittle Paper Award for Poetry ($200), the Brittle Paper Award for Creative Nonfiction ($200), the Brittle Paper Award for Essays & Think Pieces ($200), and the Brittle Paper Anniversary Award ($300) for writing published on our blog. Here are those in the running. Chapter Thirty-Three, by Binyavanga Wainaina (Kenya), in Brittle Paper. A House for Mr Soyinka, by Kola Tubosun (Nigeria), in Popula. History Through the Body or Rights of Desire, Rights of Conquest, by Panashe Chigumadzi (Zimbabwe), in The Johannesburg Review of Books. Verse Africa: The Malleable Poetics of Some Contemporary African Poets, by Matthew Shenoda (Egypt), in World Literature Today. A Stranger in ‘the Village,’ by Bongani Madondo (South Africa), in The Johannesburg Review of Books. Preserving and Writing History, Ayesha Harruna Attah (Ghana) in Conversation with Gaamangwe Joy Mogami (Botswana), in Africa in Dialogue. The Colonizer’s Archive Is a Crooked Finger, by Emmanuel Iduma (Nigeria), in Catapult “James Baldwin in Rhodesia,” by Percy Zvomuya (Zimbabwe), in The Johannesburg Review of Books. A List of Things I Do Not Tell My Mother, by Sarah Lubala (South Africa & Congo), in Apogee Journal. A Field, any Field, by Itiola Jones (Nigeria), in The Offing. Origin Myths,” by Megan Ross (South Africa), in The Single Story Foundation Journal. On the Isle of Lesbos, by Tsitsi Jaji (Zimbabwe), in Harvard Review. I Like to Think I’d Yet Manage to Weave Words into Poems,” by Chisom Okafor (Nigeria), in Expound. Summer Night Spent Cosplaying Ashanti & Ja Rule Or Something Else Resembling Happiness, by Momtaza Mehri (Somalia & UK), in Frontier Poetry. Moon Secrets, by Lauri Kubuitsile (Botswana), in The Single Story Foundation Journal. The Man at the Bridge, by Kiprop Kimutai (Kenya), in As You Like It, republished in The Johannesburg Review of Books. Involution, by Stacy Hardy (South Africa), in Migrations: New Short Fiction from Africa. Our Husband Grief, by Christine Odeph (Kenya), in Migrations: New Short Fiction from Africa (as “My Sister’s Husband”), republished in Brittle Paper. All Our Lives, by Tochukwu Emmanuel Okafor (Nigeria), in ID: New Short Fiction from Africa, republished in The Johannesburg Review of Books. An African in London and Other Reflections on African Literatures, by Richard Oduor Oduku (Kenya), Memoir. Why I No Longer Use the Term ‘Game’ for Bushmeat, by Chika Unigwe (Nigeria), Think Piece, first posted on Facebook. Bantu’s Swahili, or How to Steal a Language from Africa,” by Kamau Muiga (Kenya),Essay. The Nervous Conditions of the Mother Tongue,” by Mapule Mohulatsi (South Africa),Essay, first published in Selves: An Afro Anthology of Creative Nonfiction. On Postcolonial Theory, by Shailja Patel (Kenya), Tweets. Facebook Writers and Other Trivia,” by Alaaka Tobi (Nigeria), Essay. Jambula Tree,” by Lillian Aujo (Uganda), Poetry. For What Are Butterflies without Their Wings,” by Troy Onyango (Kenya), Fiction. You can read the full citation for the awards here. The winners will be announced on Monday, November 19, 2018. Previous Previous post: Two Africans make Almultaqa Short Story Prize 2018 longlist. Next Next post: Chimamanda Ngozi Adichie, Achille Mbembe at Africa rich Frankfurt Book Fair 2018.